How much money can you make playing online poker in 2019 is a question that I often get asked. There are a lot of different factors that can influence this such as your winrate, how often you play and if you multi-table or not. Here is a short answer. 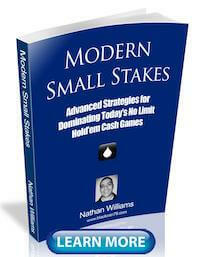 Winning poker players at stakes like NL2, NL5 and NL10 can expect to make around $100 - $500 per month. Winning poker players at higher stakes like NL25, NL50 and NL100 can make significantly more though, between $750 and $2000 per month. Rakeback and bonuses will often add hundreds of dollars more. However, these are just rough numbers for an average person who plays semi-regularly, multi-tables a bit and takes the game fairly serious (i.e. studies their hands, reads books, table selects etc). So in this article I am going to break it down limit by limit at the micro stakes and talk about just how much money a typical poker player should expect to make. And also, how you can make more! How Much Do Online Poker Players Make? Before I get started let me talk about how much online poker players make. This can run the gamut from 0$ to millions and millions of dollars a year. It is important to keep in mind though that most poker players actually lose money over the long run after the rake is taken out and they lose to the better players. Yes, that is over 44k just at the lower stakes. And yes, I had to play an incredible amount of hands to make this but it should hopefully show you what is possible nonetheless. If you want to make the real big money in poker you have to play higher limits. But you can still make a ton by playing a lot of tables and specializing in the micro stakes like I do. It is also important to remember that as a professional only a part of my online poker income comes from what I make at the poker tables. Many poker sites these days offer incentives to play through offering lucrative sign up bonuses and rakeback (giving you a portion of the rake you paid back - varies wildly 10% - 50%). 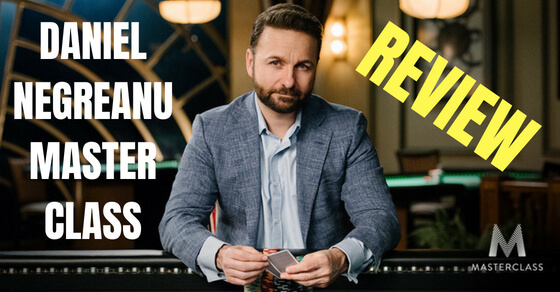 If you want to know the top poker sites that I recommend for soft games and which also have good rakeback and bonuses, you can find my top 5 list here. The bottom line though is to please keep in mind that all of the numbers that I will list in this article are not including rakeback or bonuses. Same as above, I actually made a lot more than 44k. Those are just the poker table winnings. My overall online poker income is much higher than this. Rakeback and bonuses for a very heavy volume player like myself can very easily add up to hundreds or even thousands of dollars more per month. Also, keep in mind that most poker pros like myself will make far more than the amounts that I am going to list below. This is because since this is our job, we will play a lot more poker than the average person does. Alright, let's get it started! 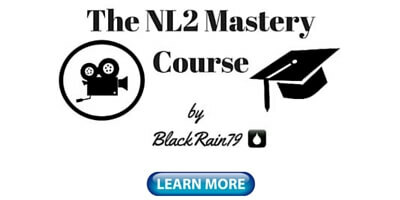 NL2 (blinds 1c/2c) is the lowest limit that you can play in online poker. The money isn't amazing by any means but the winrates are the highest here. And this is because you will find the worst real money players on earth at this stake. The amount of money that you are going to make in poker is always relative to the people who you are playing against. Play against really bad players all the time and you will crush, period. So somebody who takes the game fairly seriously (studies their hands, reads books, table selects etc) should expect to win about 15bb/100 at NL2. This means that they will make 15 big blinds for every 100 hands that they play. Again, I am assuming a decent level of knowledge about the game. Now I will also assume that this person plays fairly regularly and multi-tables a bit. Therefore, they should be able to play about 50k hands a month. So with a little bit of simple math they should expect to make about $150 per month playing NL2. For comparison, at my absolute peak of mass multi-tabling online poker I was playing about 5 times as many hands as this (around 250k hands a month). 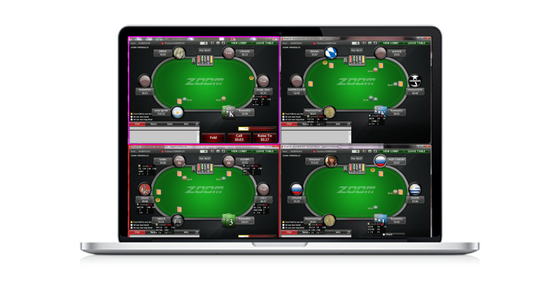 I was typically playing 18-24 tables at a time (or roughly 8 Zoom) for around 4-6 hours per day. My winrate was also twice as high as I assumed in this example. So by putting in large amounts of volume like this, at a significantly higher winrate, I was able to consistently make $1000 per month playing poker. NL5 (2c/5c) is the next stake in online poker and the players get a little bit better here. 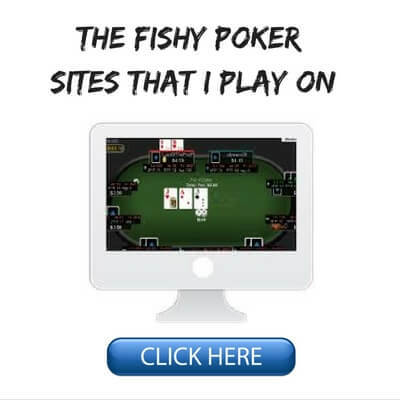 You won't find nearly as many total beginners or completely clueless recreational players (fish) either. An average person who takes poker fairly seriously should expect to have a winrate of about 10bb/100 in this game. Yes, it will drop that much which surprises some people. But as I have discussed before, you will experience the biggest relative skill gap in online poker when you make the move from NL2 to NL5. Both games are still very easy to beat in reality though for an experienced poker player. So once again assuming a monthly volume of about 50k hands, our average poker player should expect to make about $250 per month playing NL5. Definitely nothing amazing so far even after you add in the rakeback and bonuses as well. This is why I always stress that you use these lower limits to master the fundamentals of poker. Don't even think about the money yet. 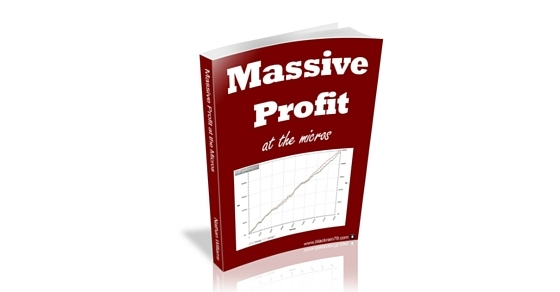 This will help you get prepared for the higher stakes where the competition tends to be quite a bit better, but the money that you can earn is a lot higher as well. NL10 (5c/10c) is the third level in online poker and the last real "beginner" limit in my opinion. The players are slightly better here than at NL5 and you need to start developing a bit more advanced strategy to really crush your opponents at this stake. An average person who takes the game fairly seriously should expect to have a winrate of about 8bb/100 at this limit. This means that assuming a monthly volume once again of 50k hands, they should expect to make about $400 per month playing NL10. Definitely nothing to write home about still but most people would probably be pretty happy banking an extra $400 a month from their part time hobby. A mediocre pro could easily expect to make 1k per month at this stake, even at the exact same winrate, by simply increasing the volume. NL25 (10c/25c) is the first limit in online poker where you can start to make what most people would consider "significant" money. Rakeback and bonuses also increase greatly at this limit as well, easily in the hundreds of dollars a month with regular play. Our average person who takes poker fairly seriously should expect to have a winrate of about 6bb/100 in this game. This means that by playing 50k hands a month they should expect to make about $750 per month playing NL25. Not a bad chunk of change! This is why at NL25 you start seeing the first players who are playing for either a significant portion of their income or all of it (full time pros). After all, many people forget that $750 a month is actually an above average income in most countries around the world. 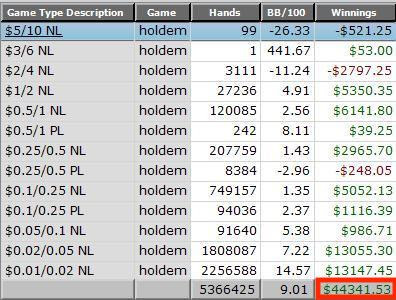 For comparison once again, at my peak of mass multi-tabling online poker I was able to consistently make $2000 to $3000 per month in this game especially once all of the rakeback and bonuses were added in. NL50 (25c/50c) is the next step up the ladder in online poker and the players are a little bit better here than at NL25. Once again you will need to have a fairly solid strategy to really crush these games. This means that you should be studying your own hands and your opponents as well. You can do this in a program like PokerTracker for instance. You should also be reading poker books, watching training videos and possibly even consider hiring a coach as well. Lastly, it is absolutely crucial that you are exercising some table selection by these stakes. There should always be at least one clear weak recreational player at your table. Otherwise you should not be playing there. An average person who does at least some of these things should be able to achieve a winrate of about 5b/100 at NL50. This means that by playing 50k hands per month they should expect to make about $1250 per month playing NL50. Definitely nothing to sneeze at. Who couldn't use an extra 1k+ per month from their part time hobby? Once again, most pros will make considerably more than this. NL100 (50c/1$) is what I consider to be the final micro stakes limit. The competition really starts to improve by this stake. You have to know your stuff in order to compete with the best players at this limit. But the money also starts to get pretty significant by NL100 and very good once you add in all the rakeback and bonuses as well. In fact, many full time pros will make an income in this game that could easily replace their full time job. Our average part time player though who takes the game fairly seriously should expect to have a winrate of about 4bb/100. This means that by playing 50k hands a month they should expect to make about $2000 per month playing NL100. 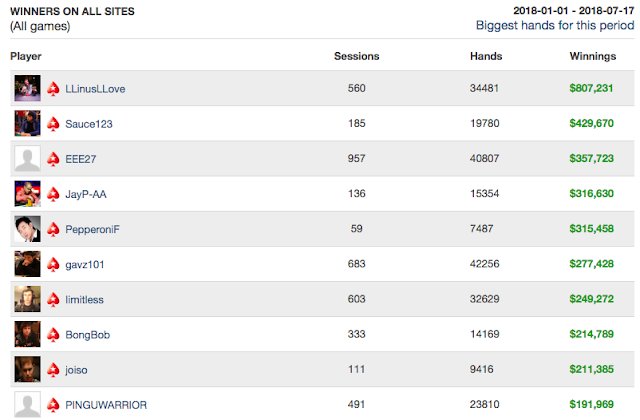 Not too bad for a playing a silly little card game on the internet in your spare time! So how much money can you make playing online poker in 2019? 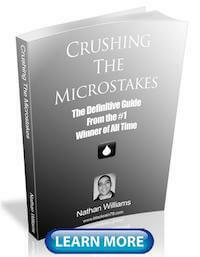 Well at the lowest stakes you should only expect to make a couple hundred dollars per month. However, if you can climb up a few limits then you can start making $1000 or more per month. And of course I did not even mention the mid or high stakes games at all in this article. A good player in these games can have online poker earnings of upwards of 10k per month. Full time pros will make 6 or even 7 figures a year in some cases. As you can see, several of them are on pace for a high 6 figure or even 7 figure year. Also, keep in mind that these numbers only include high stakes games ($25/$50 blinds and above) and they also do not include rakeback or bonuses. 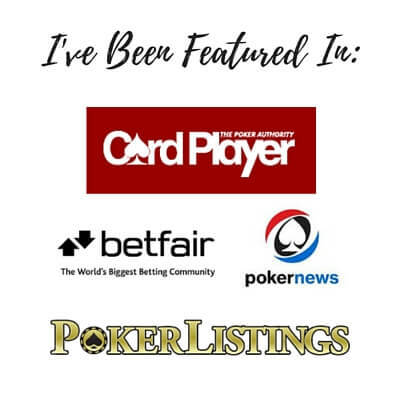 Now of course these are some of the best online poker players in the world but hopefully this will give you an idea of what some of the best online poker earnings in 2019 can be. So how much do online poker players make? Well as you can see it is all over the map. Online poker income also isn't as simple as just your poker table winnings. There are other important factors like rakeback and bonuses. And I didn't even discuss endorsements and sponsorships which can equate to huge dollars for some pros. I definitely don't want you to think that it is easy though. Success in online poker is by no means a walk in the park these days. Poker is hard in 2019. And you have to really be willing to work for it. It also does not happen overnight. 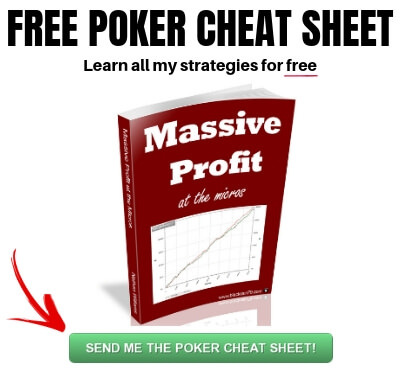 If you are new to poker and just want to learn how to start making a couple hundred dollars a month at the lower stakes then I would highly suggest picking up a copy of my free poker strategy guide. However, in order to really crush the online poker games in 2019 (making thousands of dollars per month), then you have to be willing to put in time away from the tables studying your hands. You should also be continually working on improving your skills and understanding of the game with books, videos and possibly even hiring a coach. 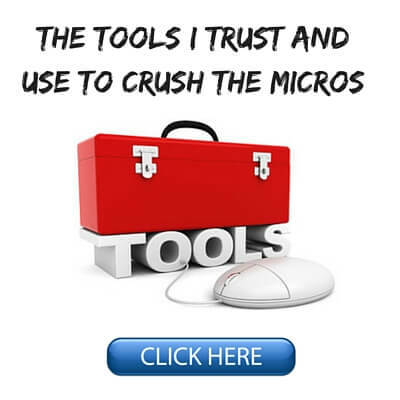 If you want to know the complete list of all the poker tools and learning resources that I use a professional, you can find that right here. Let me know in the comments below how much money you make playing online poker. Lastly, if you found this post helpful, do me a quick favor and give it a "Like" or "Tweet" below. Thanks! Very useful post..I think that at limits like nl2,nl5,nl10 you can add more volume something like 100k/month because the decisions are simpler and you can add more tables but in higher stakes I think you need more quality-A game than volume Im I right??.. Glad this post helped! Yes you are right, you can definitely put in more volume at those stakes because the decisions are often simple and you also don't need to table select as much. Glad you enjoy the blog. I actually had a stint with Limit Holdem near the beginning of my poker career. However I don't think it is that useful for No Limit Holdem. Same game but the betting structure totally changes the strategy. All your numbers are without rake. Am I right that the higher you get, the more rakeback matters? Poker is a winning and losing game, and a lot of your winnings you Need to cover your loss of the other Hands. So the lower the winrate, the more you Need to cover up, but your rakeback you get for all your Hands. All these numbers are after rake. Rakeback is actually most important at the micros because the impact of the rake is the highest at these stakes. Hi Nathan great post. With regards to rakeback, I play on pokerstars and is opening those treasure chests considered the 'rakeback'? Thanks Ryan! Yes, Pokerstars recently changed it's rakeback program over to these treasure chests. Nice post Nathan. With the help of your blog and books I have made it to NL50 with a winrate of 6bb/100 over my last 50k hands. Hoping to make it to NL100 by the end of the year! Wow nice winrate TJ! Keep me updated on how it goes for you. Hi, Nathan! Would you expect these figures to be higher or lower at the same stakes in PL0? I really don't know enough about PLO winrates to want to comment on that. A PLO expert like Joe Ingram would be the one to ask about this. Thank you, I will look him up. I'm a big fan. Just would like to know what you think the online equivalent of 1/2 and 2/5 live is? Or asked another way, do you think that a player who can regularly beat 5nl and 10nl crush the lower limit live games ? I think the equivalent of 1/2 and 2/5 live is probably NL2, NL5 and NL10 online. So if you are crushing these games, then you will probably clean up in these low limit live games as well. Nobody knows the answer to these questions for sure. Also, it will be different for every person anyways.